4pAAa2 – Uncanny Acoustics: Phantom Instrument Guides at Ancient Chavín de Huántar, Peru – Miriam Kolar, Ph.D.
Excavated from Pre-Inca archaeological sites high in the Peruvian Andes, giant conch shell horns known as “pututus” have been discovered far from the tropical sea floor these marine snails once inhabited. At the 3,000-year-old ceremonial center Chavín de Huántar, carvings on massive stone blocks depict humanoid figures holding and perhaps blowing into the weighty shells. 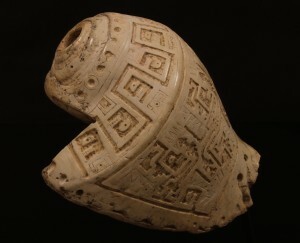 A fragmented ceramic orb depicts groups of conches or pututus separated from spiny oysters by rectilinear divisions on its relief-modeled surface. Fossil sea snail shells are paved into the floor of the site’s Circular Plaza. Pututus are the only known musical or sound-producing instruments from Chavín, whose monumental stone architecture was constructed and used over several centuries during the first millennium B.C.E. How, by whom, and in what cultural contexts were these instruments played at ancient Chavín? What was their significance? How did they sound, and what sonic effects could have been produced between pututus and Chavín’s architecture or landform surroundings? Such questions haunt and intrigue archaeoacousticians, who apply the science of sound to material traces of the ancient past. 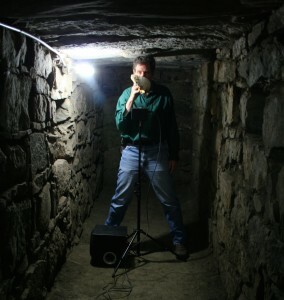 Acoustic reconstructions of ancient buildings, instruments, and soundscapes can help us connect with our ancestors through experiential analogy. 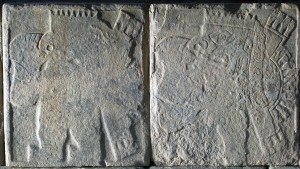 Computer music pioneer Dr. John Chowning and archaeologist Dr. John Rick founded the Chavín de Huántar Archaeological Acoustics Project (https://ccrma.stanford.edu/groups/chavin/) to discover more. Material traces of past life––such as artifacts of ancient sound-producing instruments and architectural remains––provide data from which to reconstruct ancient sound. 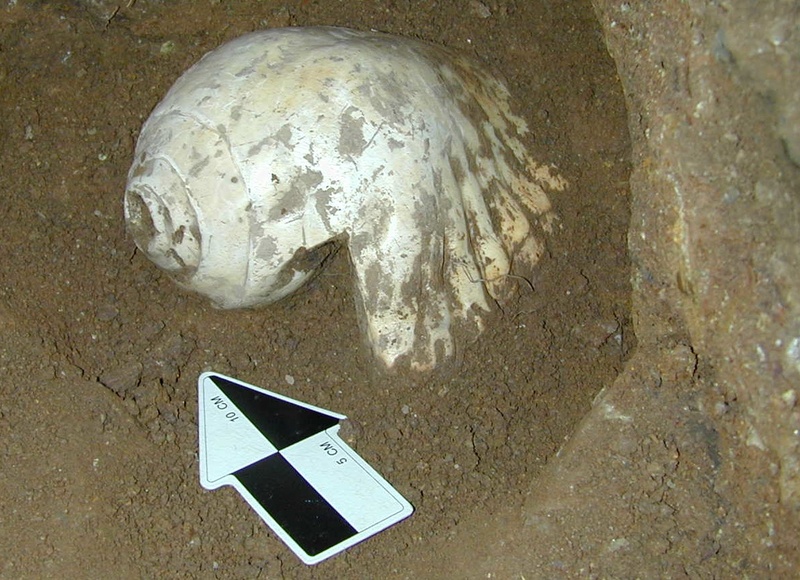 Nineteen use-worn Strombus galeatus pututus were unearthed at Chavín in 2001 by Stanford University’s Rick and teams. Following initial sonic evaluation by Rick and acoustician David Lubman (ASA 2002), a comprehensive assessment of their acoustics and playability was made in 2008 by Dr. Perry Cook and researchers based at Stanford’s Center for Computer Research in Music and Acoustics (CCRMA). Transforming an empty room at the Peruvian National Museum at Chavín into a musical acoustics lab, we established a sounding-tone range for these specific instruments from about 272 Hz to 340 Hz (frequencies corresponding to a few notes ascending from around Middle C on the piano), and charted their harmonic structure. Back at CCRMA, Dr. Jonathan Abel led audio digital signal processing to map their strong directionality, and to track the progression of sound waves through their exponentially spiraling interiors. 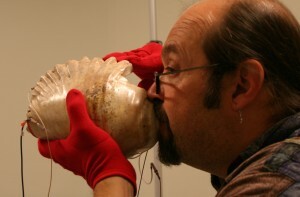 This data constitutes a digital archive of the shell instrument sonics, and drives computational acoustic models of these so-called Chavín pututus (ASA 2010; Flower World 2012; ICTM 2013). Where does data meet practice? How could living musicians further inform our study? Cook’s expertise as winds and shells player allowed him to evaluate the Chavín pututus’ playability with respect to a variety of other instruments, and produce a range of articulations. Alongside the acoustic measurement sessions, Peruvian master musician Tito La Rosa offered a performative journey, a meditative ritual beginning and ending with the sound of human breath, the source of pututu sounding. This reverent approach took us away from our laboratory perspectives for a moment, and pushed us to consider not only the performative dynamics of voicing the pututus, but their potential for nuanced sonic expression. When Cook and La Rosa played pututus together, we noted the strong acoustic “beats” that result when shell horns’ similar frequencies constructively and destructively interfere, producing an amplitude variation at a much lower frequency. Some nearby listeners described this as a “warbling” or “throbbing” of the tone, and said they thought that the performers were creating this effect through a performance technique (not so; it’s a well-known acoustic wave-interference phenomenon; see Hartmann 1998: 393-396). If present-day listeners are unaware of an acoustics explanation for a sound effect, how might ancient listeners have understood and attributed such a sound? A pututu player would know that s/he was not articulating this warble, yet would be subject to its strong sensations. How would this visceral experience be interpreted? Might it be experienced as a phantom force? The observed acoustic beating effect between pututus was so impressive that we sought to reproduce it during our on-site tests of architectural acoustics using replica shell horns. CCRMA Director Dr. Chris Chafe joined us, and he and Rick moved through Chavín’s labyrinthine corridors, blasting and droning pututus in different articulations to identify and excite acoustic resonances in the confined interior “galleries” of the site. The short reverberation times of Chavín’s interior architecture allow the pututus to be performed as percussive instruments in the galleries (ASA 2008). However, the strong modal resonances of the narrow corridors, alcoves, and rooms also support sustained tonal production, in an acoustically fascinating way. Present-day pututu players have reported the experience of their instruments’ tones being “pulled into tune” with these architectural resonances. This eerie effect is both sonic and sensed, an acoustic experience that is not only heard, but felt through the body, an external force that seemingly influences the way the instrument is played. From an acoustical science perspective, what could be happening? As is well known from musical acoustics research (e.g., Fletcher and Rossing 1998), shell horns are blown-open lip-reed or lip-valve instruments, terminology that refers to the physical dynamics of their sounding. Mechanically speaking, the instrument player’s lips vibrate (or “buzz”) in collaborative resonance with the oscillations produced within the air column of the pututu’s interior, known in instrument lingo as its “bore”. Novice players may have great difficulty producing sound, or immediately generate a strong tone; there’s not one typical tendency, though producing higher, lower, or sustained tones requires greater control. 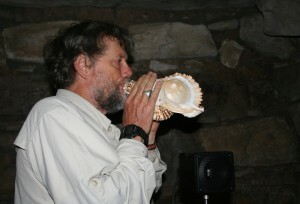 Experienced pututu players such as Cook and La Rosa can change their lip vibrations to increase the frequency––and therefore raise the perceived pitch––that the shell horn produces. To drop the pitch below the instrument’s natural sounding tone (the fundamental resonant frequency of its bore), the player can insert a hand in the lip opening, or “bell”, of the shell horn. Instrument players also modify intonation by altering the shape of their vocal tracts. This vocal tract modification is produced intuitively, by “feel”, and may involve several different parts of that complex sound-producing system. Strong architectural acoustic resonance can “couple”, or join with the air column in the instrument that is also coupled to that of the player’s vocal tract (with the players lips opening and closing in between). When the oscillatory frequencies of the player’s lips, those within the air column of his or her vocal tract, the pututu bore resonance, and the corridor resonance are synchronized, the effect can produce a strong sensation of immersion in the acoustic environment for the performer. The pututu is “tuned” to the architecture: both performer and shell horn are acoustically compliant with the architectural resonance. When a second pututu player joins the first in the resonant architectural location, both players may share the experience of having their instrument tones guided into tune with the space, yet at the same time, sense the synchrony between their instruments. The closer together the shell openings, the more readily their frequencies will synchronize with each other. As Cook has observed, “if players are really close together, the wavefronts can actually get into the shells, and the lips of the players can phase lock.” (Interview between Kolar & Cook 2011: https://ccrma.stanford.edu/groups/chavin/interview_prc.html). From the human interpretive perspective, what might pututu players in ancient Chavín have thought about these seemingly phantom instrument guides? A solo pututu performer who sensed the architectural and instrumental acoustic coupling might understand this effect to be externally driven, but how would s/he attribute the phenomenon? Would it be thought of as embodied by the instrument being played, or as an intervention of an otherworldly power, or an effect of some other aspect of the ceremonial context? Pairs or multiple performers experiencing the resonant pull might attribute the effect to the skill of a powerful lead player, with or without command of supernatural forces. Such interpretations are motivated by archaeological interpretations of Chavín as a cult center or religious site where social hierarchy was developing (Rick 2006). However these eerie sonics might have been understood by people in ancient Chavín, from an acoustics perspective we can theorize and demonstrate complex yet elegant physical dynamics that are reported to produce strong experiential effects. Chavín’s phantom forces––however their causality might be interpreted––guide the sound of its instruments into resonant synchrony with each other and its architecture. (ASA 2002): Rick, John W., and David Lubman. 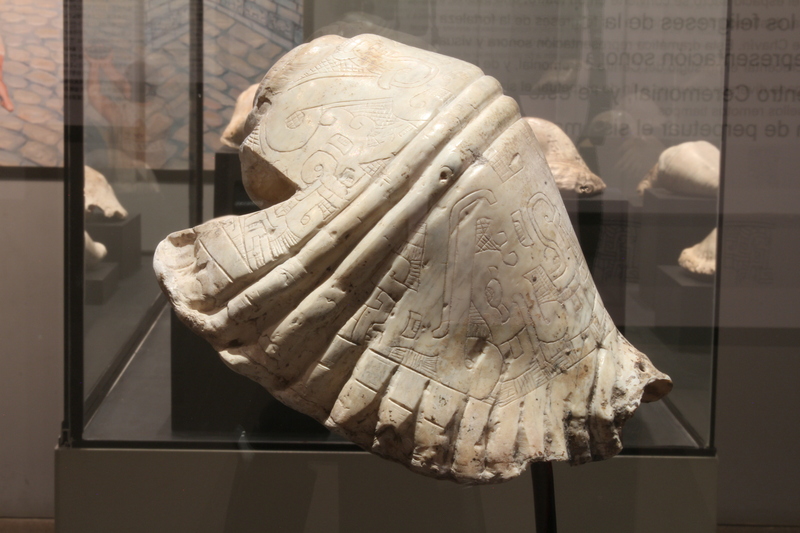 “Characteristics and Speculations on the Uses of Strombus Trumpets found at the Ancient Peruvian Center Chavín de Huántar”. (Abstract). In Journal of the Acoustical Society of America 112/5, 2366, 2002. (ASA 2010): Cook, Perry R., Abel, Jonathan S., Kolar, Miriam A., Huang, Patty, Huopaniemi, Jyri, Rick, John W., Chafe, Chris, and Chowning, John M. “Acoustic Analysis of the Chavín Pututus (Strombus galeatus Marine Shell Trumpets).(Abstract). Journal of the Acoustical Society of America, Vol. 128, No. 2, 359, 2010. (Flower World 2012): Kolar, Miriam A., with Rick, John W., Cook, Perry R., and Abel, Jonathan S. “Ancient Pututus Contextualized: Integrative Archaeoacoustics at Chavín de Huántar, Perú”. In Flower World – Music Archaeology of the Americas, Vol. 1. Eds. M. Stöckli and A. Both. Ekho VERLAG, Berlin, 2012. (ICTM 2013): Kolar, Miriam A. “Acoustics, Architecture, and Instruments in Ancient Chavín de Huántar, Perú: An Integrative, Anthropological Approach to Archaeoacoustics and Music Archaeology”. In Music & Ritual: Bridging Material & Living Cultures. Ed. R. Jiménez Pasalodos. Publications of the ICTM Study Group on Music Archaeology, Vol. 1. Ekho VERLAG, Berlin, 2013. (Hartmann 1998): Hartmann, William M. Signals, Sound, and Sensation. Springer-Verlag, New York, 1998. (ASA 2008): Abel, Jonathan S., Rick, John W., Huang, Patty P., Kolar, Miriam A., Smith, Julius O. / Chowning, John. 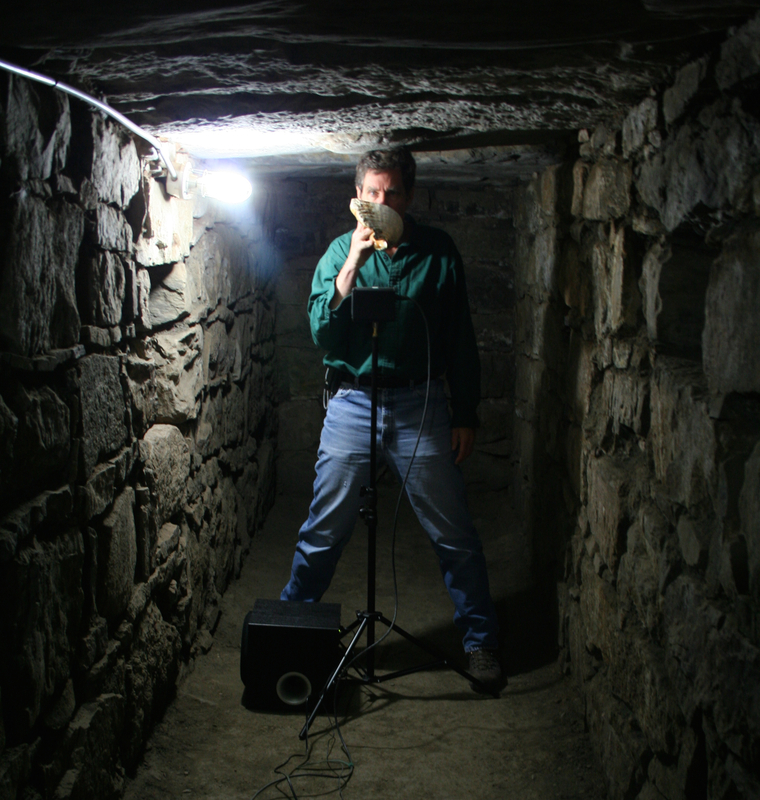 “On the Acoustics of the Underground Galleries of Ancient Chavín de Huántar, Peru”. (Abstract). Journal of the Acoustical Society of America, Vol. 123, No. 3, 605, 2008. (Fletcher and Rossing 1998): Fletcher, Neville H., and Thomas D. Rossing. The Physics of Musical Instruments. Springer-Verlag, New York, 1998. (Rick 2006): Rick, John W. “Chavín de Huántar: Evidence for an Evolved Shamanism”. In Mesas and Cosmologies in the Central Andes (Douglas Sharon, ed. 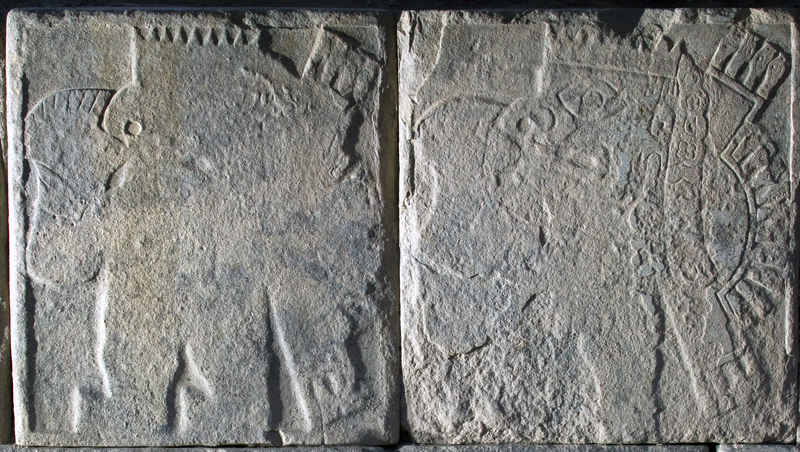 ), 101-112. San Diego Museum Papers 44, San Diego, 2006.